A New Stogie Guy Is Born! I’d like to interrupt our regularly scheduled StogieGuys.com content to congratulate Patrick Ashby and his wife Melissa on the birth of their first child! 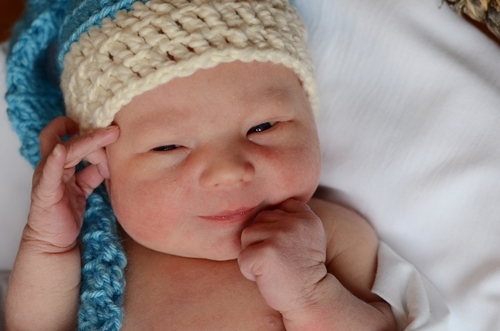 Grant Henry Ashby was born in Chicago at 1:43pm on Monday, February 18th. He is a healthy 8 pounds, 5 ounces, and 21 inches long. Patrick tells me both Melissa and Grant are doing very well and looking forward to heading home from the hospital today. We’ll resume our coverage of the world of cigars in a couple days but, in the meantime, feel free to use the comments to congratulate the Ashby family and give a recommendation for a celebratory cigar. It is always wonderfull news that a new family is formed at this day and age. Let me share one thought that a family member shared with at a similar time in my life.
" One does not fully understand the love and care of a father, but untill one has it´s own son"
Congrats to you and your wife! And when you get the chance light up a fine cigar to celebrate. Congratulations! As a daddy to 3, nothing beats family. NOTHING. Wishing you and your family health and happiness on your journey. Congratulations Patrick & Melissa, Grant is a fine looking baby!! Re a cigar recommendation, have a JDN Celebration of course!!! Huge congrats to the Ashby family! Congratulations, Patrick and Melissa! And welcome to the world, Grant. In about 20 years you'll get to find out what's in the humidor. Until then… listen to your father. Congratlulations to the both on the birth of your son,Grant Indeed it is great news . Many congrats and best wishes to the Ashby family. That is one fine-looking young man! Let me recommend a cigar Patrick A already loves: the Drew Estate Velvet Rat. Congrats! We had our baby the day after after 7:36am, didn't think we'd end up so close in time. Congrats on the baby boy! We just had a boy in January and went with Grant for the middle name, we also considered Henry as a first name. Maybe he'll assume some stogieguys.com responsibilities one of these days!